Pitching Publications or Content Writing: Which Should You Choose? First of all, if you don’t see writing as a calling, you should probably consider another profession. I’m not kidding—not even slightly. If you don’t have that yearning, that “thing” that pushes you to keep going in spite of every damn obstacle in your way, just walk away. This industry is already competitive enough without people whose hearts aren't in it trying to stake their claim. I believe you have to want it as badly as other artists who want to create and make it in their respective professions—be they musicians, illustrators, sculptors, painters or actors. Being an artist is tough enough for those of us with the calling, but if you don’t have the drive, why should anyone want to read anything you’ve written if you don’t even believe in what you’re creating? People don't just read; they feel the words. And in my humble opinion, if you don't feel it, they won't either. Indeed there are those who fall/fell into writing by accident, perhaps as an aspect of their job. I’m not talking about that. I’m talking about the longing to express yourself with words. People can argue with me but I feel it has to start with a calling. If you’re still with me, the next step is deciding what kind of writer you want to be. It's certainly glamorous to see ourselves as a published book author or a pulitzer prize winning reporter but the reality is most of us end up doing content writing—especially in the beginning. Why? Right place, right time kinda dumb luck! So what's an aspiring writer to do? Quit? Definitely not! But you may have to manage your expectations while you build a marketable skill: content writing. The good and bad about being a content writer is the same: content writing is a skill that a good portion of the population can learn to do. However becoming really good at content writing is another story and so don't eschew it just because your competition may be a "writter" who is really a graphic designer, website coder or medical doctor certain they're gifted writers. In my introductory blog about freelancing, I shared the story about how I got into content writing. Both my parents were writers. My father was the head writer for ABC News from 1974 to 1988. Prior to that he was with the New York Times. My mother was a writer and editor for The New Yorker Magazine and a regular freelance writer for The Atlantic. As I got older I had what I perceived was a third strike against me: I didn't finish college. Despite the first two strikes against me, I managed to get a scholarship to a journalism school in New York City called The New School where I held a 3.75 GPA. I was learning broadcast journalism from the masters: meaning writers working at the newspapers, radio and television stations who taught part time. 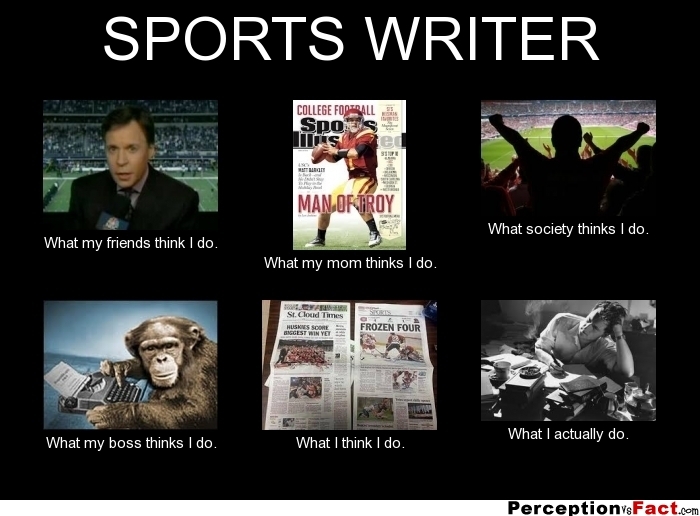 Many told me I had what it took to become a sports writer. When the scholarship ran out, I had a choice: try and get a better paying job and a student loan and pay the tuition myself or drop out. At $333 a credit along with the cost of books, I was looking at $5000 a semester This was in the 1980s. Today The New School's undergraduate tuition is $1640 per credit. At today's tuition cost 12 credits per semester, it would be $19,680, which doesn't include the cost of books. At just 19 years old (I started college at 17), I had a good job as an associate producer at CBS Radio in their newsroom with a weekly salary equal to what one credit at The New School cost. I'm not a fan of debt, so I dropped out and went into marketing. I didn't get back into writing until I was 42 and had been in the corporate world for over two decades. Of course when I decided to become a writer just ten years ago, I believed myself capable of writing a book, having bylines with The New York Times and that doors would open. I'm not alone. In fact, I think this meme and variations of it describe the disillusionment many new and non-writers have about our profession. I'm not suggesting you can't go for bylines right away but unless you hit gold immediately and you need to pay your bills, you may have to consider content writing either before or while you're pitching publications. I also realized writing essays and reported pieces for bylines wasn't as easy as having an idea, pitching it, writing and delivering the article to an editor. I had to come up with a unique angle on the same story that may have been told several times before. And just because I was/am sure my unique angle was cool / inspiring enough to capture readers' attentions, the reality is people are on different plains from me. I had to adjust the language and tone of my writing to fit the publication and their audience. Sometimes that's painful, sometimes it's fine. It depends on the publication. I ended up choosing the path of least resistance and did content writing, i.e. ghostwriting. I ghostwrote web content and books and for several years it paid the bills nicely. But eventually I felt unfulfilled and I asked a friend of mine who was just getting pitches accepted how to do it. I didn't quit my content writing day job while I started pitching (and I still haven't). As I get pitches accepted, I write those articles at night or on the weekends. So What's the Big Difference Between Bylined Writing and Content Writing? On the outside looking in, I bet most people who are new to either or both may assume bylined writing is easier than content writing—after all we're writing about topics we love and in many cases they are the stories of our lived experiences. I'm not sure if this is typical or not but I find content writing to be pretty easy. A client gives me a brief, I go off to conduct research and deliver an article or a book. It's rudimentary for me. I go through the motions and it's not very exciting, but I earn a steady income. Writing an essay requires me to dig deep and pull out feelings I may have buried for weeks, months or even years, and I can't do creativity on demand. Many writers can but I'm not very good at it. I have to be in the right frame of mind to write a personal essay—regardless of the topic. Once I'm there, the words flow and I can usually finish it within a few hours. With a reported piece, I not only have to do research (even if it's a topic I know a ton about) but tracking down people to interview can be a challenge. I recently wrote a piece about Veterans Day and medical marijuana for Big Buds Magazine. I was given a month to write the piece, which, I determined, was just right. One of the people I wanted to interview wasn't available when I was and vice versa. I finally decided it was best to text him the questions and he answered each one piecemeal. It took him almost a week to get me all of his responses. Once I got his replies, I had to restructure part of my article because I had made some assumptions that weren't accurate. With content writing it's pretty cut and dried—at least for me. I can typically write an article for a client in under two hours—depending on the topic. The pay may or may not be as good as for a byline but the work involved (for me) is far less. While it might seem I'm trying to discourage you from pitching publications and writing bylined pieces, I am absolutely not. I am simply trying to give you a realistic view of things. You may have to take some ghostwriting gigs while you're trying to build a name for yourself as a bylined writer. One way to make content writing more exciting is to write about topics that are interesting to you and come easily to you. Although you may have genres you are passionate about when pitching publications (mine are race and gender advocacy, physical health, mental health, geopolitics, organic farming, addiction and medical marijuana), don't limit yourself when you're new to content writing. Try your hand at a few topics, even ones you never imagined yourself writing about. For me it was pets, travel and health. Put your little spin on the articles. Not all clients like this but most do. I always leave a piece of myself in each article I write for a client—even if it's not a first person narrative piece. Challenge yourself. You never know, you may determine you have a love for a topic you might never have considered. And the last one will help you segue into bylined writing. As you get comfortable with a client, ask them if you can put your name on a piece now and again. Some will say no but many will be happy to let you. Alternatively you could always start pitching right away and try your luck. There is definitely an art to it and I suggest taking advice from veteran freelancers. There's nothing more frustrating than knowing you've got a great piece on your hands but your pitch wasn't compelling enough to capture an editor's attention.